In this presentation, Dr Shlomit Guy, drawing on research material from her book Good Lads Play Football: A Year Visit At The Chelsea And Arsenal Academies (2015), discusses some of the critical changes undergone by English football as it has transformed from largely a working-class sport to a branch of elite culture. During the 2007/2008 season, Dr Guy visited the football academies of Arsenal and Chelsea once or twice or week, watched the youth players play, conversed with their parents, and interviewed coaches and managers. Good Lads Play Football represents an insightful observation of how the English football academy system has historically operated, from a non-English perspective. Guy, S (2015). 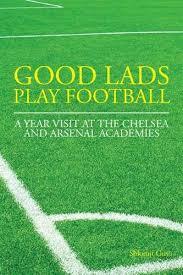 Good Lads Play Football: A Year Visit At the Chelsea And Arsenal Academies. DB Publishing. Dr Shlomit Guy is a sports researcher from Israel. During 2006-2008 she conducted field research in London for her doctoral thesis in anthropology, submitted to the Ben-Gurion University of the Negev. Dr Guy had published two books in Hebrew; Empire: How did England Reinvent Football (2011) ( in the Israeli press awarded `the sports book of the year`, and Good Lads Play Football (2014 in Hebrew, 2015 DB publishing house). Today she is the head of the physical education studies department in Kaye College for education, and also teaches at Sapir College. Her courses deal with plays, games, education and the prevention of violence. In addition, Shlomit is very active with mentoring young sport persons, and is an adviser to a number of sport clubs. She is also a member of a number of governmental committees and advises the Israeli Ministry of Sport. Her biggest ambition is to use the practices of peace she acquired in England to help promote peace to the Middle East.